IKAT! Ikat can be a little hard to deal with for someone like me who is into planning, charting and precision. I count my warps carefully…this one needs to be floated, this one doesn’t and, oh no, I made a mistake and must un-weave and…. 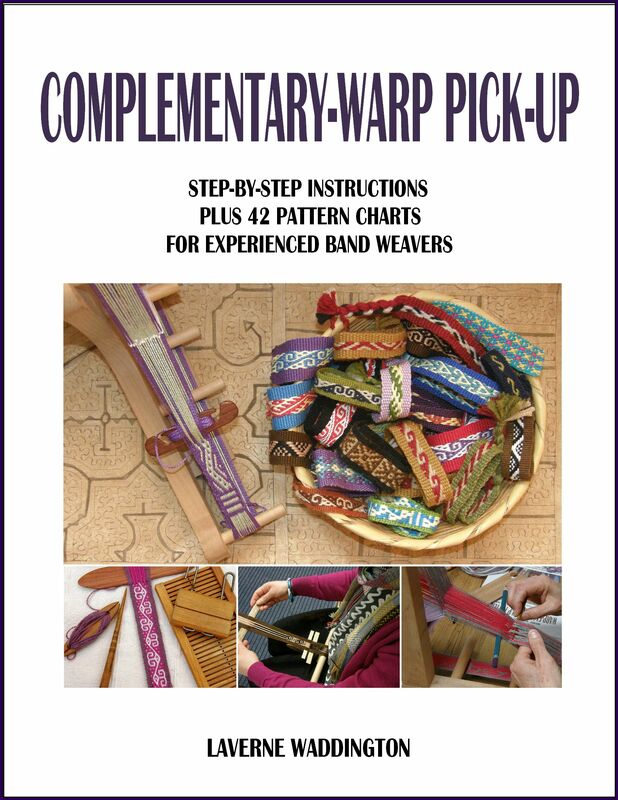 darn!, the design is not looking as I thought it would…better un-weave and re-chart. I am not one for “winging” it or just throwing a warp on the loom and seeing where it takes me. I am even less crazy about letting a “blip” become a “design element” although my work often has such blips! When I have tried ikat, the tie-dyed warps wandered off as they pleased once I started weaving, blurring the design to the extent that the original planned pattern became totally unrecognizable! You can wrench the warps about and try to get them to behave or just let them go and appreciate the beauty in the “blips”. You can probably guess which one I am more inclined to do. Way back when I first tried ikat on the above warp I thought that it was all about the tying and dyeing and I was so nervous. Had I used the right wrapping material? It took me a while to settle on cassette tape after trying cabuya fiber (a kind of agave) and then strips cut from plastic supermarket bags. Had I tied tight enough? Was I using the right kind of dye (answer: NO…I used cotton dye on wool which gave me a wishy washy pink instead of the Mexican red promised on the package). Would the wrapping allow the dye to seep? Once I had dyed the warp and unwrapped part of it to see my lovely crisp and sharp pattern I was delighted. Now to get to the weaving…the easy part, right? Just plain weave, a piece of cake. And that is when everything went quite mad. The warps slipped around out of position with every move I made, the parts of the design wouldn’t line up and I was terribly disappointed. 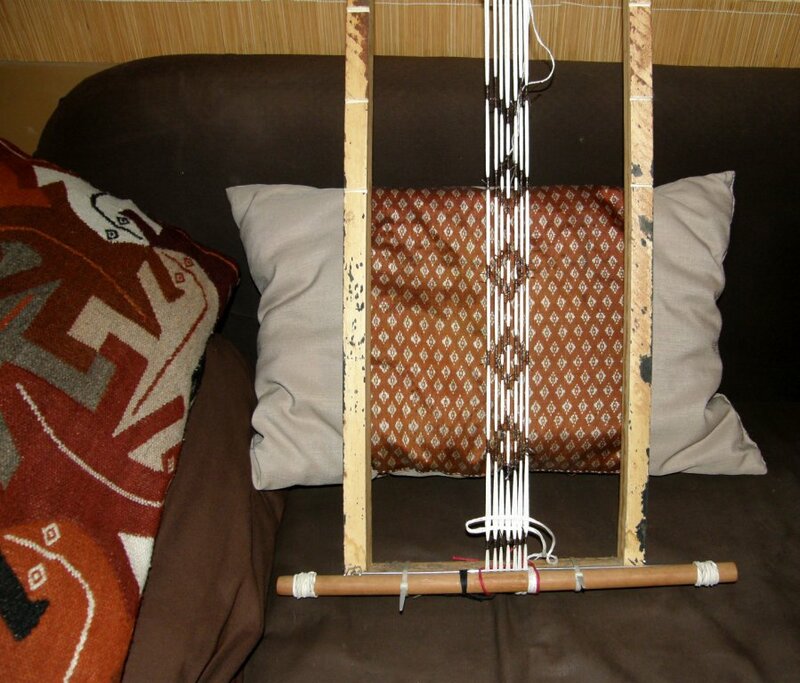 On my trip to Guatemala in 2008 I bought this…a prepared ikat warp ready to go on the loom. “Ikat the easy way”! I exclaimed. This warp had been prepared by the experts and surely it would turn out nicely. I took just one section of it and put it on my loom….it was coming out even worse than my own experiment. At least on mine the first motif looked kind of okay. I put it aside very quickly. I just couldn’t bear the thought that someone had gone to all the trouble to tie and dye this warp only to have me come along and mess it up. It’s still there in the closet. Once you have had an ikat disappointment, it is not really something that you feel like launching into again in a big hurry…all that time spent tying, dyeing, waiting for it to dry. In any case, I felt that I hadn’t really learned anything from the exercise to warrant another attempt. I needed to do some thinking about what needed to change about the way I was handling the warps. But I did take something away from the experience – a growing awe and respect for the ikat weavers around the world! My gosh, the work they do creating those amazing images in their cloth. The motifs have that wonderful fuzziness in their outlines which is what makes the technique so attractive. This is a piece from Indonesia from a collection of textiles owned by Phil Willett that he and the late Dennis Penley collected. Of course the warps move out of alignment but not so much that the image is completely lost as mine was. Just the right amount of shifting is what makes this piece beautiful. I saw an ikat bed cover that my weaving teacher in Candelaria was weaving with both hers and her husband’s names spelled out in the tie-dye technique, watched ikat weavers with their backstrap looms in the towns around Cuenca in Ecuador, saw ikat warps being prepared for floor looms in Salcaja in Guatemala, gazed at the amazing Central Asian ikat robes at the recent exhibit at the Textile Museum in DC and got to touch and examine a Mapuche ikat warp for a poncho on the loom at an exhibit at the National Museum of the American Indian in DC late last year. 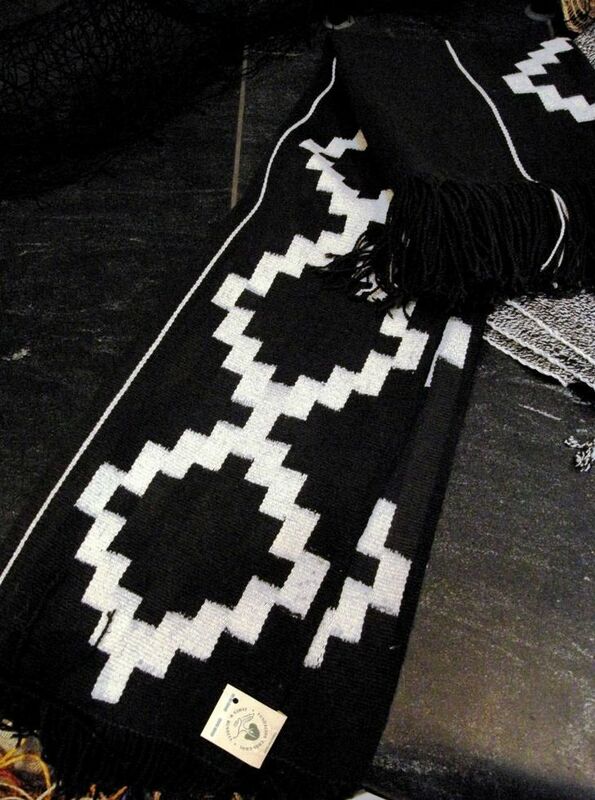 The Mapuche ikats are known for the minimal shifting of the warps in the design and the relatively clean and crisp outlines the patterns have as a result. Ikat! Sigh! I read an article here just today that describes it as “as trendy as anything ancient can ever claim to be”. I am not trendy by any stretch of the imagination and wasn’t aware that it was so. In any case, the “trend” does not appear to have reached Santa Cruz, Bolivia. The article says that “this kind of pattern now lends interiors a kind of dressed up Bohemian vibe”. Let’s hope that this is good news for the artisans and that people are aware of the incredible amount of time and skill that goes into the pieces and will be prepared to pay fair prices accordingly. This video, which was embedded on Ravelry recently, shows one group’s enterprising way of mimicking the appearance of ikat. They produce large lengths of cloth with large fuzzy-outlined ikat-like images without the long tying and dyeing process…. 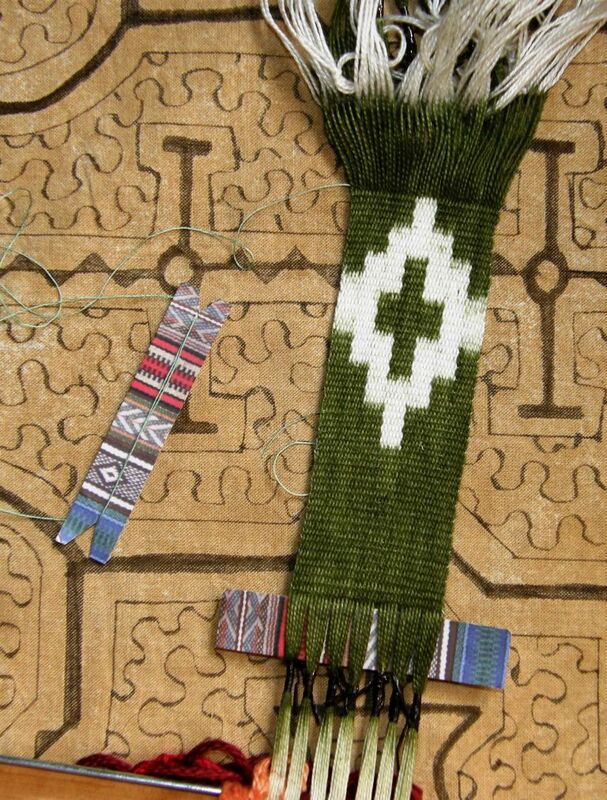 Schumacher – Darya Ikat Weaving Process from Schumacher on Vimeo. And I have seen other interesting ways to imitate the look of ikat in the online weaving groups…the “faux ikat” using painted warps. Weaver Bonnie Tarses has a video here that shows how to set up for what she calls “almost ikat”. 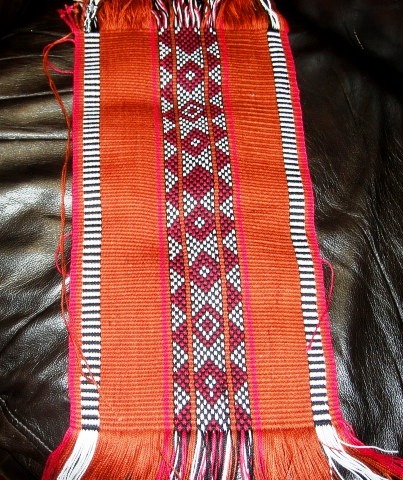 In this WeaveZine article Syne Mitchell shows how to create an ikat effect with painted skeins on a rigid heddle loom. The beauty of the piece is all about the very misalignment of the colored warps that I have been struggling to avoid. See how the “blips” are turned into beauty! 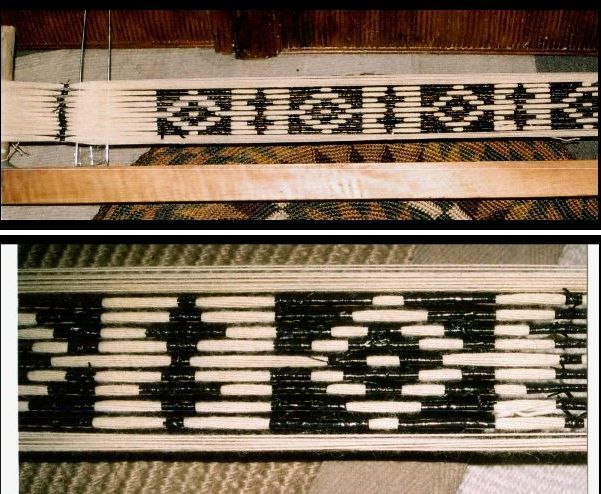 I would love to weave something like that but I know that I would spend the whole time fussing with the warps and trying to get them to line up! I just wouldn’t be able to stop myself! Ravelry member jtellier wove a faux ikat scarf on her rigid heddle loom, which you can see below, and shared it with us for inspiration when we were planning our plain weave weave-along in the Backstrap Group. Now we are doing an ikat weave-along and have four participants so far. 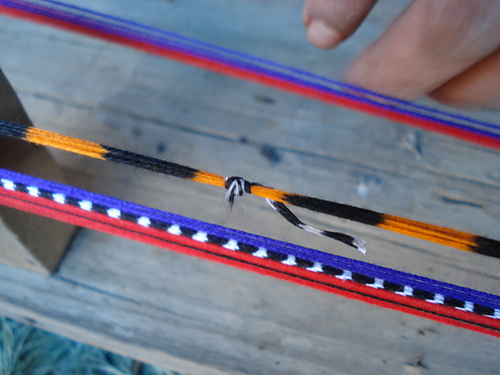 In this current weave-along we are trying to do true ikat by tying and dyeing the warps. We recognized that we needed to go into it with the right attitude. I didn’t want people to end up as disappointed and frustrated as I did after my first attempt and so we are all participating with the idea that we will definitely create something “interesting” if not exactly what we had in mind in the planning stage. I have got some ideas and theories together about how to create my ikat pattern with a minimum of blurring in the design. My weaving friend Tracy and I discussed how the Mapuche weavers appear to leave all their ties in place on the warp and only unwrap enough of a bundle to give them the minimum of space in which to open the sheds and pass the weft. 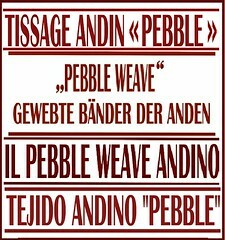 I have tried weaving without unwrapping everything beforehand (the warps still slipped) but not to the extent that the Mapuche weavers do. 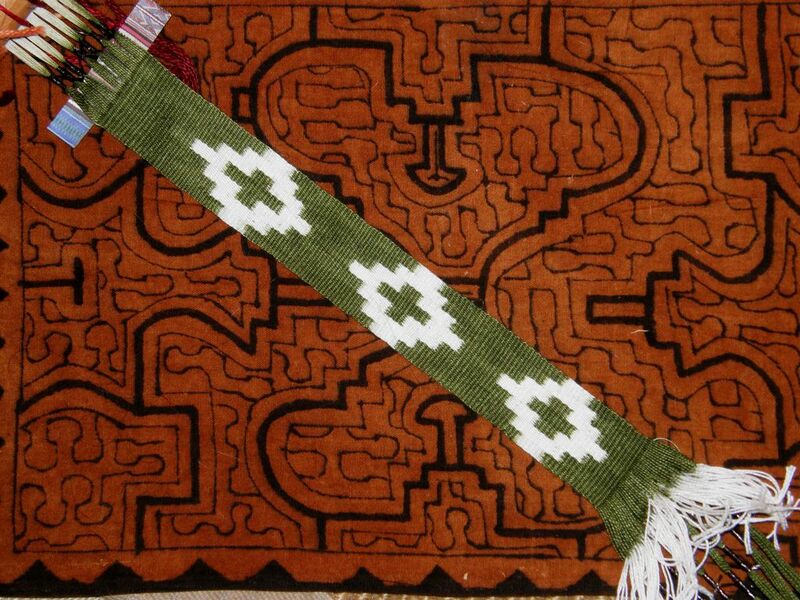 I was also intrigued by this picture on the Education and More website, on their backstrap weaving page, of a warp in Guatemala which has been glued to the loom bar with corn masa. (Karen from Education and More tells us that it is used as a paste to secure the threads). Hmmm… I thought. Maybe I can use diluted white glue to do the same. 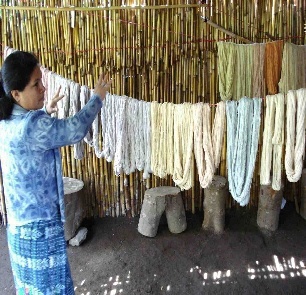 It shows how some ikat weavers, with whom she works in Guatemala, tie cotton around the sections of dyed warps to stop the warps from moving. I suspect that cotton against cotton holds well and does not slip. I have tried doing that with the cassette tape. The tape is far too slick to be effective. Doesn’t that warp look gorgeous! And the final inspiration came from a Chilean lady on Facebook. A Facebook friend of mine “liked” her picture which is what allowed me to see her at work on an ikat piece on a wooden frame loom. I so wish I could have posted the picture here but I have not yet made contact with the weaver and, if I do, I will post the picture next week. I saw that she too was working in a very small space between the partly unwrapped ties and the weaving line. She had a separate bar which appeared to part of the frame loom which was her shed rod. Unfortunately only a very small part of the loom can be seen. 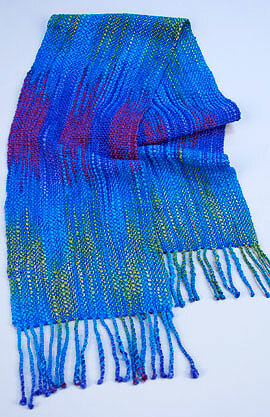 What interested me was that she had multiple sets of small heddles around the groups of warps that she had wrapped. Each group had its own string heddle rather than having one large string heddle across the entire warp. So I decided to use all these tactics in my project. As an experiment, it is not a very well conducted one as I will never be sure which of the new tactics will be responsible for the result…one or any combination of all of them. Ah well. First came the warping and wrapping. I set up the warp on a frame to wrap with cassette tape…still my favorite medium. I did not get carried away with the size of the warp. I guess that tells you something about my confidence, or lack thereof, in the success of the project! This is a cotton warp. Here it is after dyeing with Dylon Olive Green cold water dye. I had dyed a skein of Plymouth Yarn with the green and this warp got tossed in at the end. The color is a little uneven and I kind of like the sort of washed-out look. So here is the first motif. I was very pleased but still reserved in my excitement as I know from experience that the first motif generally works quite well. Things tend to go mad after the frst one. My friend Annie will recognize the business card that she gave me back in 2010 which I am using to start the weaving and as a wee shuttle. I still have it, Annie and I hope you will give me a new one when I see you in March! 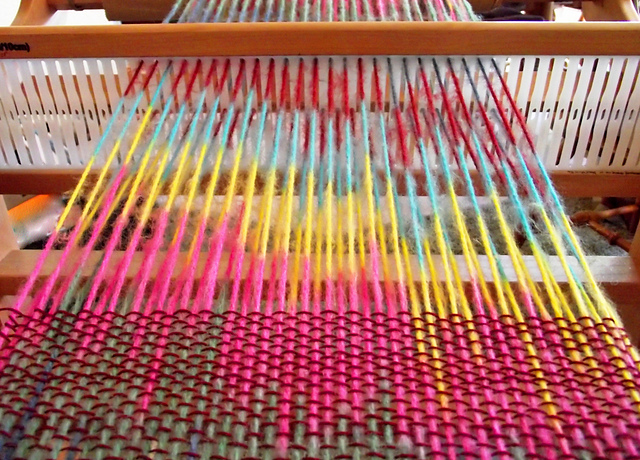 The warp at the loom bar is stiff with white glue which never entered the dye bath. The cassette tape ties down there are fairly ineffective. The warps just slide right through those but I like to think that they help a little. Cotton ties like the Guatemalan use would have been better. You can just see the bunches of white string heddles. And I used a very fine weft. The warp is similar to a #10 crochet cotton. Of course I forgot to dye yarn for weft. 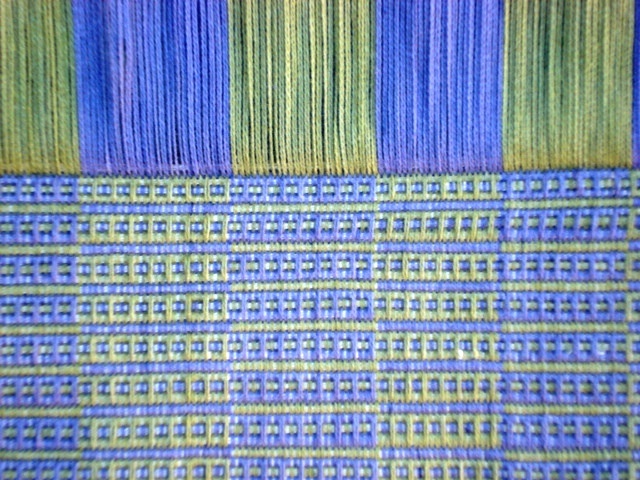 I wove with this fine weft to start and finish the rep weave piece I showed last week and I really liked the feel of the fabric it produced. Here are three finished motifs and all is well. The motifs are all a little different. I was not precise in my measuring and wrapping of the segments. The space in which I open the sheds is tiny and I am thankful for the fine sword that came with a Guatemalan backstrap loom that Linda in California gave me. I am using shed loops for the non-heddled shed. One shed loop for each section. Three more motifs to go and I will be done…short and sweet! Very sweet! I am pretty happy with this. Now, which tactic or tactics produced these pleasing results? Good question! 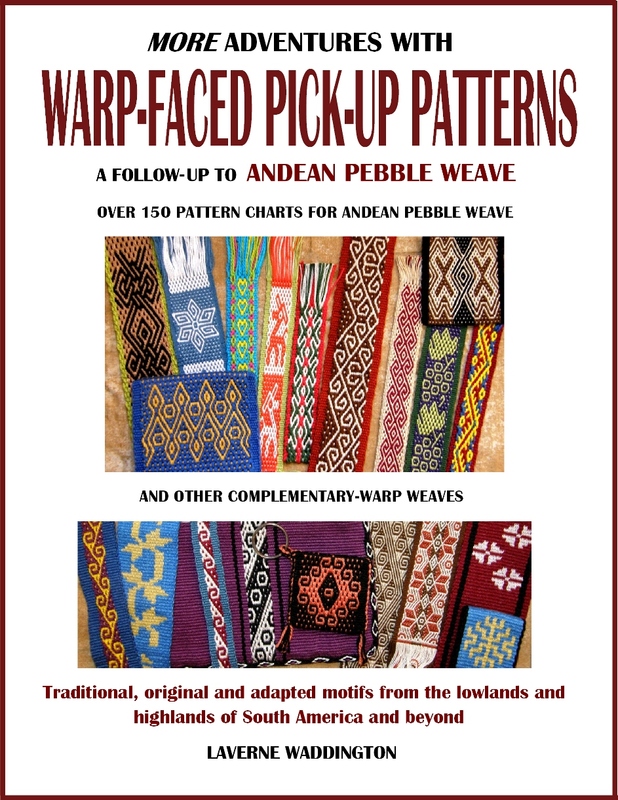 What about the backstrap weavers who just go and unwrap all the ties, throw the warp on the loom and weave away producing beautiful results?…no “glue” or teeny tiny weaving spaces with teeny tiny bunches of heddles. I am completely in awe of these people. 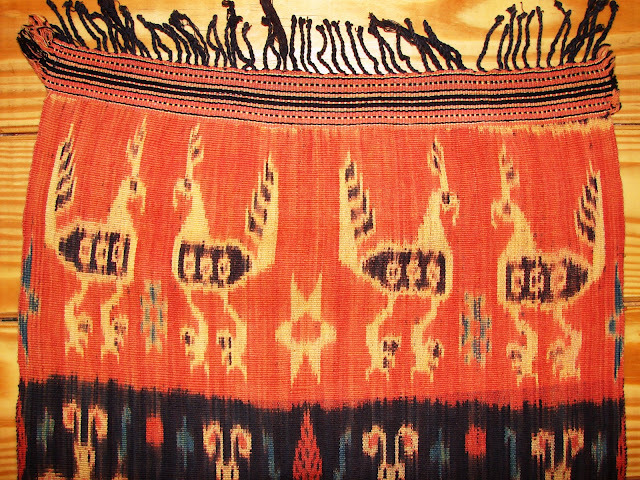 And what about the ikat weavers in Uzbekistan? My friend Pam took this picture in Uzbekistan and has allowed me to show it here. The ikat Master marks the mordanted warp and the ladies do the tying. 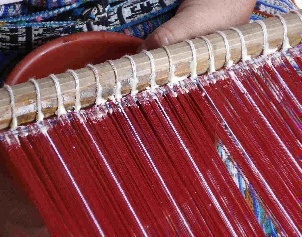 Often the warp is mounted in layers on the frame so that multiple layers can be included in each wrap to repeat the patterns along the length of the entire warp. I got the idea of mounting my warp on a frame to wrap from seeing this picture. 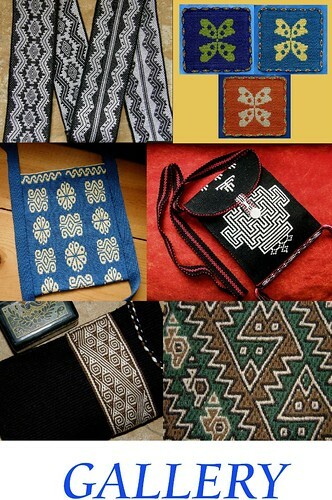 The Education and More site which I linked to above and Flickr page have lots of beautiful pictures of Guatemalan weavers and textiles including many images of ikat weavings. Did you know that Education and More is selling naturally dyed cotton from Guatemala on their website now? Bobbie who is in the Ravelry group is not joining us for the ikat WAL. 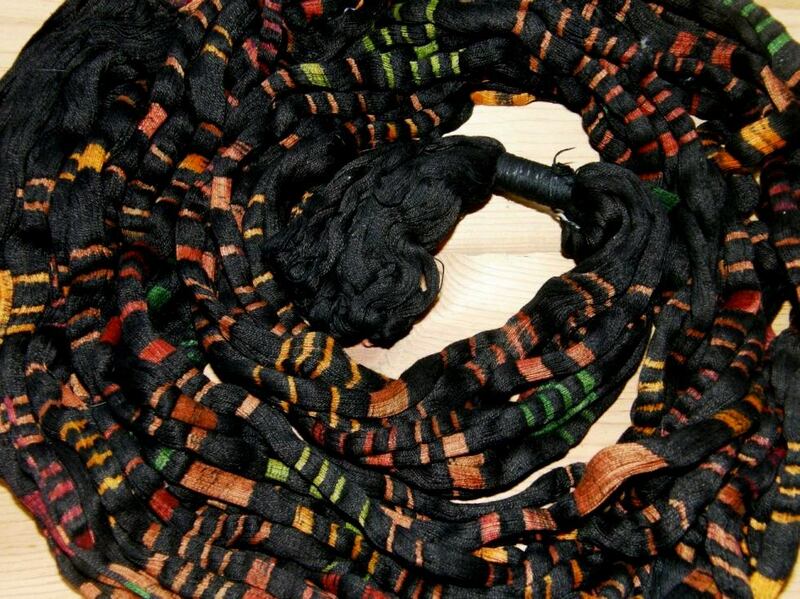 She has just received her shipment of naturally dyed cotton yarn and has launched herself into a new project which has been inspired by this Guatemalan piece. It is from the Education and More page and Jennifer discovered and shared it with us. It is the simple warp float technique and very effective. As for ikat….will I go to all this trouble again? Yes! Now I am thinking multiple colors and trying to figure out how best to do the layering….it will be another sample. I will probably sew the current piece onto a piece of woven fabric. It is fine enough to do so, I think, and I would really like to use it. In the meantime, I have started the next part of the si’ira inspired piece. All that counting had me procrastinating I am afraid…576 ends in the pattern area. The first row of pick-up is crucial. All other rows are picked up relative to that one and I can tell you that it is not fun to discover on row 20 that the lines in the motif are not meeting as they should because the first row was picked up incorrectly! So I really have to be in the right frame of mind to work on that first row…check and re-check. And, it is done! and I am off and running. congrats on succeeding with this ‘go at the ikat’, it looks awesome and the crosses are barely fuzzy at all. Look forward to seeing the next bigger project. Also to the si’ira piece. I’ve got two double weave pieces just of the warping board, finally found a good way to set up, and the first few rows are woven. I think that’ll take the rest of the year…. thanks for the beautiful post again! Great success with the ikat! Wow! That turned out great.These motifs are very nice. 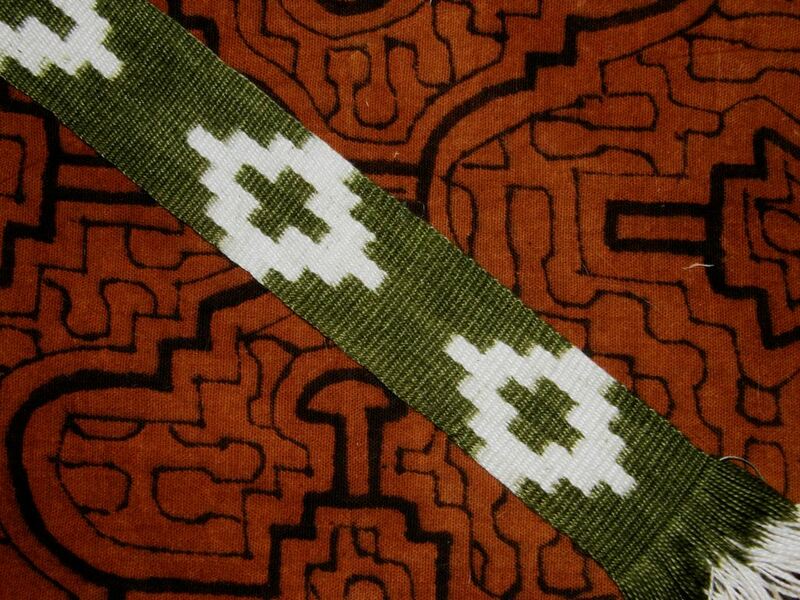 I have been seeing a lot of Mapuche patterns on the web lately and love them! Thanks for the laugh about buying dyed yarn in Guatemala and screwing up the pattern. It makes me feel better about my similar experience. I’m glad to see you using the cards and yes you can have more; I should be getting a new order next week. I haven’t heard of Education and More, so now I’ll be off to check them out. wow what a great sucess with the ikat weaving .I have only just found your site on the web and it has opened up a whole new world of weaving to me thank you so much. keep the emails coming. Hi Laverne, great post! I adore ikat (and sell quite a lot of it) and especially ikat from Sumba, Indonesia. It’s so fine and the madder dye is always so pleasing. I love your posts and have been meaning to reply to one much soon than this, but you know how it is. 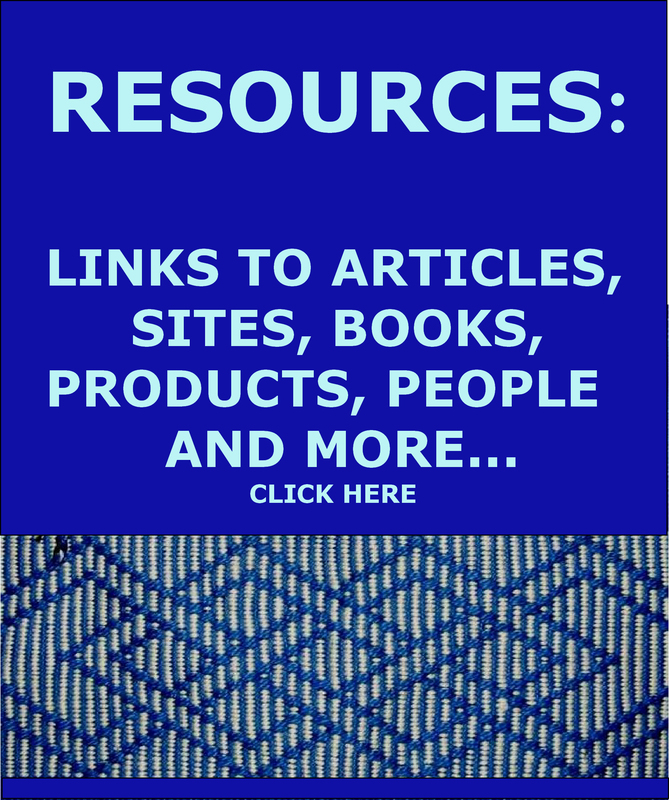 I have you to thank for getting me started on backstrap weaving! I have only done a couple of pieces, but it’s so much fun. I am travelling to Peru in May, and would have loved to go to Guatemala to see ikat being done, but I doubt my travel plans will allow. When I get the time, I will show you what you have taught me!